If you have seen any recent videos of Alexander, you may notice that he says “good job” after nearly everything. And just the other day, I was playing Tetris on my computer. Every time I cleared a line, he said “good job”. It was cute. 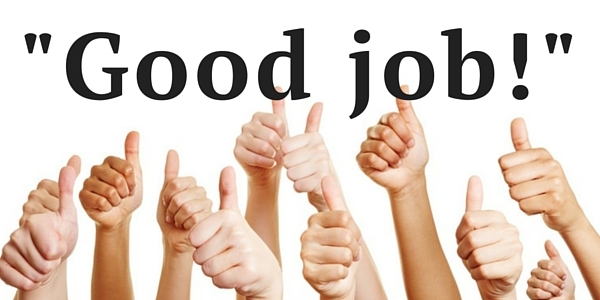 As you may have heard before, using the phrase “good job” isn’t recommended. In fact, a lot of parents (especially in the Montessori world) are completely opposed and never use it. They even think it’s a bad thing. And that is fine! That’s their opinion, and we’re all entitled to ours. I can totally see that extreme and the rationale behind it. For us, it’s a little too late to stop using it entirely. Let me suppose for one second that you have no idea why “good job” isn’t so good. There are a couple of main reasons. It’s totally non-specific. Let’s say that Alexander finished his puzzle and put it back onto the shelf. If I say “good job”, am I applauding the fact that he finished his puzzle (one that he’s completed 50 times) or am I applauding the fact that he put the puzzle onto the shelf (something he’s expected to do and something he’s done dozens of times)? Or maybe I’m applauding the fact that he finished the puzzle faster than he ever has, with zero mistakes (not that I keep track of that!)? It means that I’m creating the standard for what a good job looks like. This one means more to me, as a former teacher. I understand #1, but this one is more important in my opinion. If it took him 5 full minutes to complete a puzzle, and he was actually bummed about taking so long, and I come along and offer an enthusiastic “good job!”, then he’s like, “Oh I guess 5 minutes is good enough” even if he could finish it in 4 minutes. And maybe next time, if he wanted to finish it in 4 minutes, he could, but he thinks that 5 minutes is good enough, so he doesn’t push himself. And what about the times when he doesn’t finish the puzzle at all. Is that a bad job? Is mommy not happy with him? Maybe he got tired… does that mean he’s done a bad thing? Okay okay, he’s a 2 year old. And he probably isn’t thinking about it like that at all. But it’s a HABIT. It’s like, I don’t want to get used to saying “good job” every time he does anything. Basically, he needs to be proud of himself on his own and not worry about whether he has my approval. If I always tell him “good job”, then the times I don’t tell him anything, will he not find any pride in his own work? It may seem a little silly, but now that I’m living with a little person who says “good job” to every tiny task that someone completes, I see how silly it really sounds. I mean, if I finish my plate of food, I don’t need anyone to tell me I did a good job. If I finish folding the laundry, I don’t need to know that’s a good job. It’s just a job! I’m not proud of myself because it’s not a big deal. I don’t want him to find a false sense of accomplishment in small things, nor do I want him to seek out approval for everything he does well.